I have been running this blog since my pregnancy days. 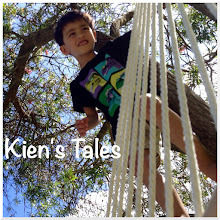 It has been (and continues to be) my record/account of what is happening in my life, but more importantly how Kien is developing and (the mischief) he gets up to. Thank you to everyone who reads this blog and sends me messages. It is nice to be able to connect and share in our experiences, and it is always so lovely to hear from you. I've been so flat out lately at work, and by the time I pick up Kien, get home, organise dinner, feed Kien dinner, get him bathed and into bed, read books, spend the ensuing fifteen minutes after lights out getting him back into bed - well, I'm just exhausted and need to crawl into bed. Photos stay unsorted/unedited, and by the time I get around to it I've got over a whole week's worth to put up. That's what Kien calls my dad - ông ngoại, meaning grandfather in Vietnamese. I usually bring a toy for him to play with, and he's been really loving his RC cars lately. He can drive it all around the shop. My aunt often comes over when we are there, and frequently brings Kien gifts. She is currently undergoing another round of chemotherapy, and when she's done we are all going to Vietnam for a holiday. I love our Tuesday morning playgroup sessions. They are always a lot of fun for the both of us. We were making beaded necklaces and brackets, and half way through Kien decided he didn't want any beads on his string. He moaned and groaned until he got all the beads off. He used the string to tie up the helicopter - but of course! Shared morning tea - he eats lots of fruit. We've been frequenting our favourite Japanese yakitori bar with Kien for dinner sometimes. Last night we stopped into Jef's city office afterward. Kien had a blast. He scribbled on the whiteboard, and Jef called him from another phone and they had a long conversation. It was so funny. One of the reasons we are able to take him to restaurants is because he loves his iPad. We've loaded it up with lots of videos of helicopters, diggers, himself, and his newly discovered favourite - TuTiTu clips. Friday tomorrow, yay! Long weekend, double yay! Extra long weekend for me, triple yay! The contrast between last Sunday and this Sunday (today) couldn't be more different. Today was cold and mainly wet, and we spent the majority of our time inside. Last Sunday however was an outdoors kind of a day. We were on North Head in Devonport, looking out over the deep blue harbour to Auckland city while white puffy clouds and pale blue spread provided contrast between sea and sky. Cheltenham beach looked beautiful from up here with the sheltered stretch of shelly sand. Kien, of course, was in his usual energetic state. If you haven't noticed he just really likes to jump off things. We were here mainly for the tunnels. But in reality we explored so much more from above then below. Sometimes he says he is scared of spiders, but it doesn't seem like it when he stops and talks to them. He also playfully says he wants to eat them. The boats were out racing that day, lots of them. We headed down the walkway to the beach where we came across a digger. We must have looked like the dorkiest parents as Jef was taking photos with his iPhone as well. I'm going to have to string the photos into a movie for Kien to watch. Jef and I were talking about how funny it was that we were thinking the days of playing in the sand at the beach were finished for the season. Last Sunday feels like a really long time ago. Today two little toddlers were inside. We were visiting Kien's grandma, who happens to be Thomas' great grandma. I am bracing myself for a tough week at work as I've been asked to contribute to a couple of major projects. It will be fine, just mentally draining. Being challenged is good for me. Have a wonderful day tomorrow, wherever you are. It is perhaps one of my most favourite places to visit. I love this place. On Saturday morning I left Jef at home to do chores while I took Kien out. We had such lovely weather despite the temperature drop. But inside the glass house it was beautiful, and warm. No matter how hard I tried to catch him and tell him not to he insisted on picking me a flower. Luckily Chrysanthemums were abundant here, so I let him pick one (I know, naughty me!). He was so excited to see goldfish here, and stood staring at them for ages. I told him there were more outside. He watched the sparrows, and ran up and down the stairs, around and under the pergola. As we walked to the car he saw all the kids on the field playing soccer and wanted to join in with them. I told him to just run around on the sidelines through the leaves. He was very distracted by the kids training - running up the hill and through the trees. Then he made a beeline straight for the puddle. We spent the next hour inside the museum. It was a fabulous way to spend a beautiful Autumn morning. It's nice to do catch-ups with kids that have known each other for over half their life span. A couple of weeks ago we had another awesome kids dinner gathering. I love these; it's just a fun way to accomplish what would ordinarily be a routine/chore on a Friday night. I'm pretty sure we all appreciate the variation. I didn't even get a picture of the host, who was busy in the kitchen making pizzas for our kids! Ponsonby playgroup is always a good place/thing to do on Tuesday mornings. It is nice being able to watch Kien play. With the help of the Activities Coordinator he made me a card giving me lots of coupons for treats - like 1 bug hug, 1 big kiss, quiet time. I tried redeeming my "quiet time" coupon numerous times. I'm sorry, but time-out doesn't count. Maybe I have a better chance of redeeming the coupon when he's 13. The day before Mother's day we stopped at a store looking for a DVD reader and exited the store with two items, none of which was what we went into the store for. He liked his Mother's day gift(s). Please ignore the state of the utility rug. We do. There’s something to be said about censorship and an online persona. I find the online mummy experience can sometimes appear like a competition in perfect Pinterest projects and happy pictures of beautiful lives. I’m sure I’m guilty as charged, and I’m not saying that those things aren't real; it’s just that life is multi-faceted, multi-dimensional, multi-layered. It is a lot easier to post pretty pictures wrapped in niceties of our daily experiences than to delve into the complexities of solitude, sacrifice, dejection and cynicism plaguing the restless mind. One can be absolutely truthful and sincere without having to divulge much of the other side of the equation. So there it is; a short and sharp paragraph telling you everything that is going on with me at the moment, and perhaps nothing that is reflective of my life. I find myself seeing beauty in pictures of dead leaves. And rain droplets beading on lemon grass blades. My son fell asleep holding his transmitter for his RC car. That made me smile. I think (I know) I need a holiday; somewhere warm with palm trees and perfect white sandy beaches that beckon me to roll out of bed and straight into crystal clear waters. My third mother's day experience - ever. For as long as I can remember I've either not acknowledged it or spent the day feeling sorry for myself for not having a mother to celebrate. I never realised how fulfilled I could feel until I became a mother, and how much I would love the experience. Here's a little movie I put together of my third mother's day. If you are receiving this post via e-mail please see the movie by clicking here to go online and view, or if all else fails here is the link to it on youtube. I've yet to sort through the photos I took on Sunday so I'll probably have an addendum.